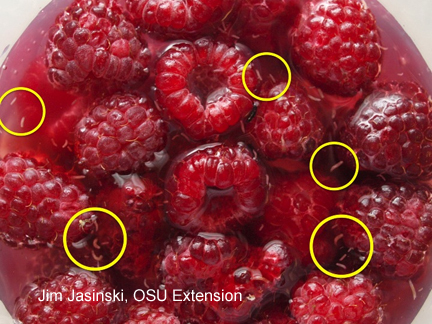 I received a report of "white worms" in fall-bearing raspberries associated with the activity of the non-native invasive pest, Spotted Wing Drosophila (Drosophila suzukii). Spotted Wing Drosophila (SWD) is a tiny fly, nearly indistinguishable from our native common vinegar flies (also called fruit flies) without a magnifying device. Male flies have 2 distinct black spots on the wings, giving it its name. The male and female also have 2 dark bands on their front legs and the female has a hardened, serrated, saw-like ovipositor (egg-layer). It is that hardened, saw-like ovipositor that makes all the difference between this new pest and the familiar drosophila of yore. Where the native "fruit flies or vinegar flies" we are used to seeing hover around and lay eggs in overripe and rotting fruit (like bananas on the counter), SWD is able to lay its eggs in barely ripe or underripe fruit. She can saw into that firmer flesh to deposit her eggs. By laying eggs in under ripe fruit, they BEAT US to harvest! By the time homeowners and commercial growers alike are ready to harvest those perfect berries, the eggs are already inside. The larva, tiny white fly maggots, are already hard at work eating the fruit. Larva will feed inside fruit for 5 to 7 days and pupate inside or outside the fruit. The SWD lifecycle has many generations per year. One generation can complete in 8 to 16 days and will REPEAT until the weather says otherwise (killing frost). Which is why a report in October is not so unusual! This leads to a shorter shelf life, fruit collapse, and yes- tiny white worms floating to the top of the bowl of water you rinsed them in, your jam pot full of sugary goodness, or when making pie filling! Not a nice sight when you're expecting some tasty treats! SWD have been known to lay eggs in cherries, raspberries, blackberries, blueberries, grapes, peaches, plums, s strawberries, pears, apples, and tomatoes (cherry/grape varieties)! But most often I hear about them in the brambles here in Medina County. So how can we deal with them? Monitoring is important so you know if you need to spray, and when to begin. Trap designs are available that include a container with apple cider vinegar with soap (to break surface tension) or yeast + sugar mixture bait. But this will attract native vinegar flies and spotted wing drosophila both! So having a microscope or powerful magnifying glass will be key for you to look for those black spots on male wings or the stripes on the forelegs to distinguish SWD from others. Once even one SWD is found in a trap, a spray program can begin. Other ways to monitor include testing berries. A sample of berries can be collected and placed in a tray, bowl, or large ziplock bag. Pour over the berries a solution of 1/4 cup salt and 4 cups warm water. After 20 minutes, check the water for signs of the white larvae which will float to the top. Here is a factsheet for the saltwater test. There are many products available labeled for use on various fruits to help manage spotted wing drosophila for both commercial growers and homeowners. Celeste Welty, OSU's fruit and veggie pest specialist, has excellent factsheets available on her site listing pesticide options for commercial growers (link) and homeowners (link). I would just mention that on both of these factsheets please note the residual activity and pre-harvest intervals for each product when selecting, and also to make sure to READ THE LABEL INSTRUCTIONS on any purchased product because label instructions may have changed since the creation of the factsheets linked above. For those who are not interested in pesticides, there are some cultural practices one can adopt to help potentially reduce infestation from these flies. Fruit should be harvested as soon as it is ripe and cooled in a refrigerator or freezer immediately to stop insect development of eggs and larva if present. Here is a factsheet explaining the longer and colder the fruit is kept in cold storage, the higher the mortality rate is for the eggs/larva. In the berry patch or garden, cleanup will be key. Do not leave rotting berries on the ground for flies to complete development. Harvest all ripe fruit and dispose of any overripe or fallen fruit. Do not put them in a compost bin where development can continue. Rake up leaves and debris under berries, trees, or vines to minimize areas where flies can shelter. Welty, C. 2013. Spotted Wing Drosophila: A new pest in Ohio's fruit crops. Factsheet. Jasinski, J. 2015. Salt Water Test for Spotted Wing Drosophila (SWD) Larvae. Factsheet. Celeste Welty's Vegetable and Fruit Insect Pest Management Blog.